For many travelers, getting through airport security is one of the most frustrating aspects of flying. Long lines combined with regulations that seem to change constantly can be anxiety-inducing! One way to reduce your stress is to dress smartly. Another is to be familiar with the rules set by the Transportation Security Administration (TSA) regarding any items you want to pack. Here is some more guidance so you can sail through TSA security and get to your gate worry-free. Planning ahead and packing properly can help speed up the screening process and ease your travel experience at the airport. In the U.S., you may bring 1 carry-on bag and 1 personal item into the passenger compartment on most airlines. Discount airlines, such as Spirit, have stricter rules. Also make sure that your luggage fits in the allotted baggage space. Each airline has slightly different requirements, so make sure to check your airline for more information. 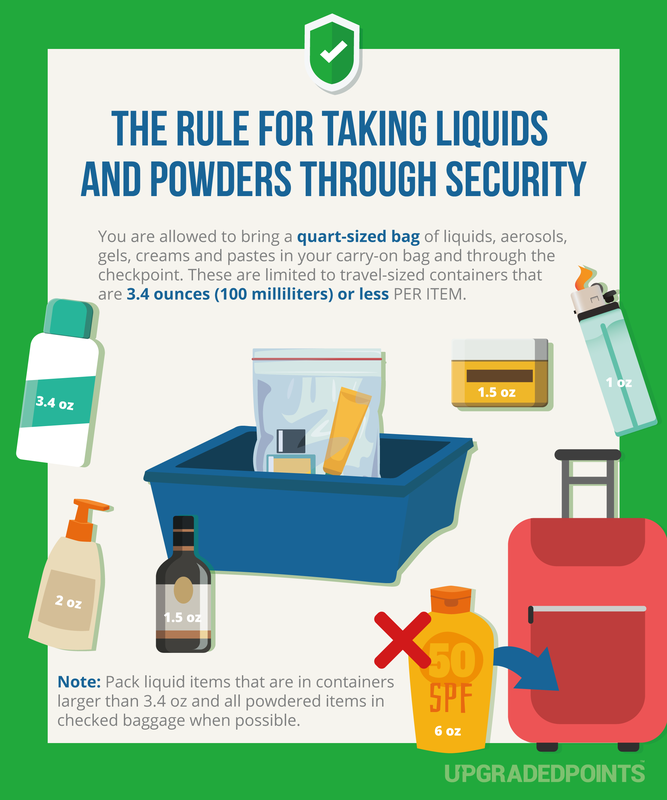 Per TSA requirements, all liquid and gel items must be 100 milliliters (3.4 ounces) or smaller per item. Every liquid and gel product you carry into the passenger compartment must meet this requirement and fit into a single, 1-quart zip-closure clear plastic bag. 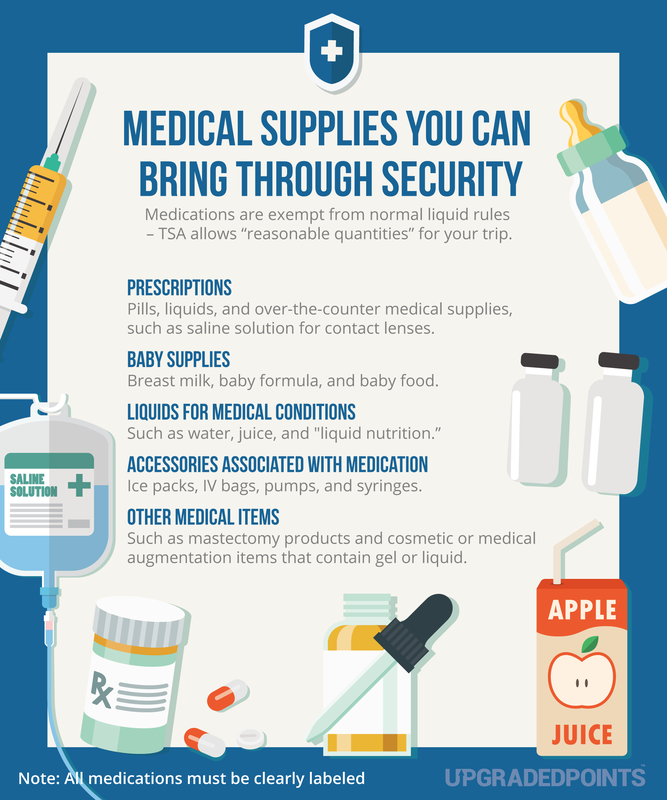 If you must bring larger liquid or gel items, you will have to place them in your checked baggage unless they are medically necessary. Anything larger than 3.4 ounces will be confiscated (including bottled water!). Based on recent guidance from the TSA, starting on June 30, 2018, powders may need additional screening. Consider putting powders into your checked bag unless they are medically necessary. Hot Tip: You can travel with food if ice packs are completely frozen at the security checkpoint! Make sure all medications are clearly labeled. In addition, you must declare these items to security personnel and be prepared for them to inspect the items. Hot Tip: NEVER put prescription medications in a checked bag — carry on all medications. 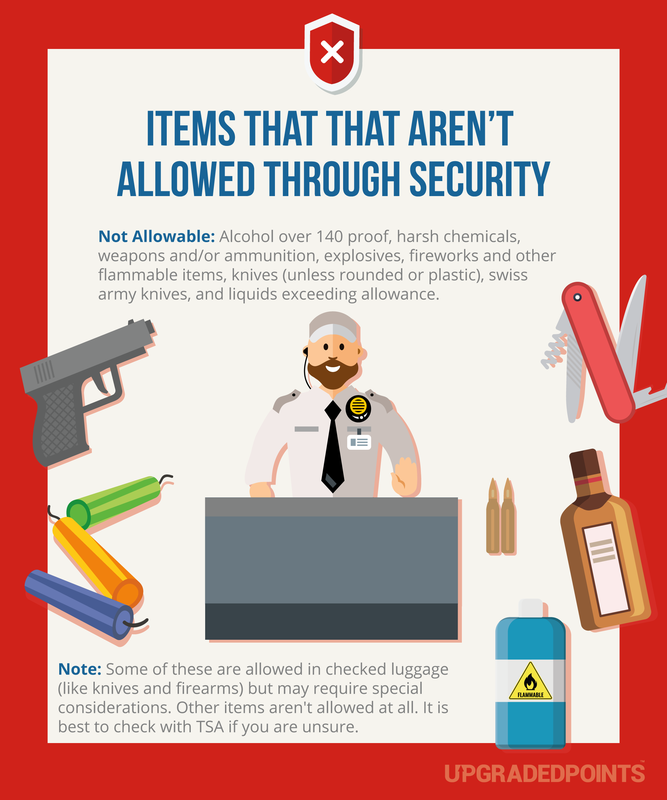 For a full list of items that are not TSA-approved, check their website. Even if an item is permitted, it may still be subject to additional screening or not allowed through the checkpoint if it triggers an alarm during the screening process, appears to have been tampered with, or poses other security concerns. Bottom Line: TSA always makes the final call on whether an item is allowed through security or not! If in doubt, pack the items in your checked luggage or don’t bring them at all. For items that you’re not sure about, you can always send a picture or question to AskTSA on Facebook Messenger or Twitter. They are available during normal business hours to help you before your trip. You will have to take your jackets and shoes off at the security checkpoint and put them into a plastic bin for screening unless you are over age 75. Wear shoes that require minimal effort to take off and put back on — you’d hate to re-lace those knee-high boots if you’re in a rush! Also, several thousand people walk through the metal detectors each day…so you will probably want to wear socks. Wear clothing and shoes without metal, and be ready to remove your belt if it has a metal buckle. Tuck large metal jewelry pieces into your carry-on bag before you go through the security checkpoint. Put change and keys into your carry-on or empty your pockets into a plastic bin when you arrive at the checkpoint. If you have body piercings, either remove them before you go through security or prepare yourself for a pat-down screening. The MyTSA app, available in iTunes and Google Play, includes features that show what you can (and can’t) bring past security. They also note current security wait times, identify PreCheck lanes in airports, and offer TSA feedback. This is a super handy tool to use for judging what time you need to arrive at the airport! Check in online to avoid a long wait at the airport. You can usually check in online 24 hours before your flight, all the way up to an hour before your scheduled departure. Though TSA does not actually offer any specific recommendations for airport arrival time, but the general rule of thumb is 2 hours for domestic flights and 3 hours for international flights. TSA does recommend contacting your airline for a better estimate based on your specific day and time of travel. Obviously times like holidays and weekends will be busier than your mid-day Tuesday flight! Be sure to factor in traffic to the airport, parking and shuttle transportation, airline check-in, obtaining a boarding pass, and going through the security screening process. Hot Tip: You can check the MyTSA app above for a real-time update of security wait times and make plans accordingly. To avoid starting your travel day off on the wrong foot, you should consider these tricks to minimize your time waiting in long airport security lines. Remember to bring a government-issued photo ID, such as a driver’s license, passport, or permanent resident card to the airport. Your ID must show your name, date of birth, gender, and an expiration date. Have you heard about the upcoming deadline to obtain a REAL ID? 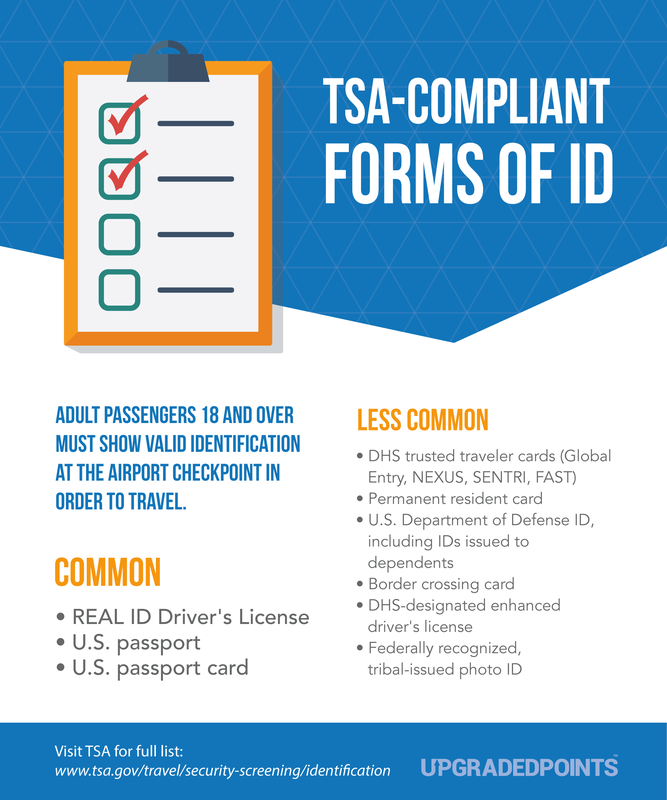 It’s important to read up about everything you need to know about REAL ID and how it relates to the documents you need to bring to the airport. Place your tickets and ID in a spot that’s easy to reach so you won’t have to fumble around for them in the security line. We wouldn’t be doing our job if we didn’t discuss the absolute fastest ways to get through airport security — trusted traveler programs! 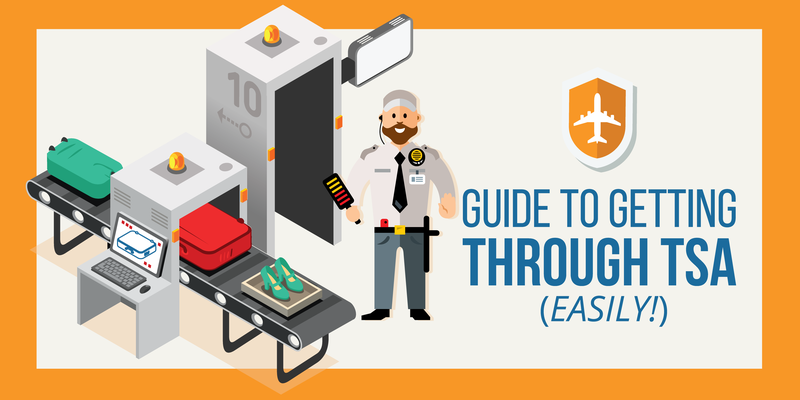 TSA PreCheck and Global Entry are the most common, but many airports also have CLEAR as well. TSA’s PreCheck has spread to more cities across the U.S. and is now available at more than 200 airports and over 55 participating airlines. Members of the program are pre-screened and can whiz through security without having to take off their shoes or remove laptops from cases. According to the TSA, 93% of travelers wait in line less than 5 minutes! We’ve written an extensive guide to TSA PreCheck where you can learn more about the program including costs, requirements and which credit cards will reimburse you for the membership fee! The U.S. Customs Department’s Global Entry program is another shortcut for frequent international travelers, especially as the federal government immigration and customs lines get longer. For a lot more detail on Global Entry, please see our guide here. Hot Tip: While Global Entry helps international travelers speed through U.S. Security AND Customs on your international flights, membership comes with TSA PreCheck to help you speed through security on domestic flights as well! CLEAR uses biometrics (your eyes and fingertips) instead of traditional photo identification to help speed you through the security checkpoint. This program is not available at all airports, so make sure this would be beneficial to you before signing up. Just because you are a member of a trusted traveler program, it does not ensure that you won’t be randomly selected for a search by TSA! 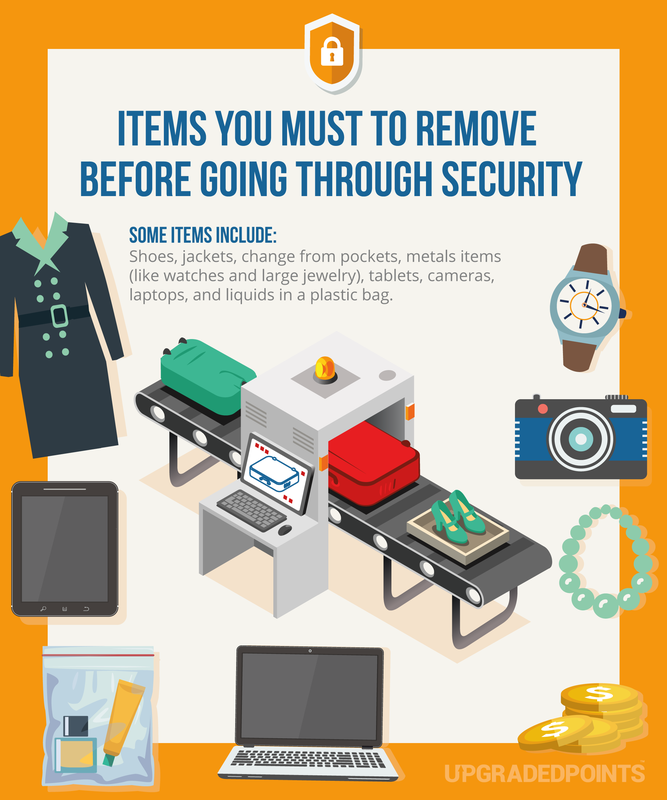 Unless you have TSA PreCheck, you will have to remove various items, such as liquids and electronics, from your luggage and place them in separate bins before going through security. In addition, you will have to remove your shoes, items from pockets, jewelry, and large jackets. There is recent guidance stating that you may also be asked by TSA to remove snacks and powders for additional inspection — so be prepared for those items to be screened in more detail. Note that if you are over the age of 75, you are exempt from removing your shoes and jackets. Travelers using wheelchairs, mobility aids, and other medical devices still need to go through the airport screening process. TSA screeners will inspect and physically screen wheelchairs and scooters. You will need to put smaller mobility aids, such as walkers, through the X-ray machine. If you use a prosthetic limb or wear a medical device such as an insulin pump, you will need to inform the TSA screener. You may be asked to undergo a wand inspection or pat-down, but you will not need to remove your medical device. Traveling through an airport with an animal can be incredibly complicated and stressful — so much so that we actually developed a comprehensive guide on traveling with pets through airports. Within this article, we included tons of tips to make your travel with your animal (service or otherwise) seamless. All animals must still pass through the security checkpoint, so reading our guide will help you prepare for this process. At a minimum level, be sure to let the TSA officer know that you are traveling with an animal. They will not have to go through the X-ray machine, but will have to go through the metal detector or be patted down just like a human. If your animal has a crate, it will have to be passed through the X-ray machine. TSA officers will expect you to control your animal during this process. There are things like the medical devices noted above that may require additional screening. TSA officers sometimes ask to look through your luggage or need to perform additional screenings of your person. The best thing to do is to familiarize yourself with TSA rules and processes for screening passengers, so you know exactly what to expect and what to do if your screening officer does not follow established procedures. If you wear a head covering, TSA typically allows you to keep your head covered during the screening process. However, if your head covering is too concealing, you will be asked to undergo a pat-down screening, which may or may not involve removal of your head covering. In this case, be sure to ask the screening official to conduct the pat-down and/or head covering removal in a screening area away from public view. Buying 2 bottles of rum at the duty-free shop may save you money, but it may not save you time if you have to change planes after clearing customs. You’ll need to put those 2 bottles into a checked bag, as the liquids rule still applies to duty-free items (no containers larger than 3.4 ounces). If you have a nonstop flight, you don’t have to worry. Hot Tip: Do you have other questions about security screenings that we have not addressed here? Check out TSA’s website. Once you arrive at your destination, make sure you have everything you brought with you — after leaving the secured area, you will not be able to return. If you realize that you did leave something, locate the nearest help desk or information booth within the airport. They will be able to help you retrieve any items that may have been left on the plane or in the secured area. It’s never fun standing in long airport security lines, especially if you would rather spend that extra time relaxing in the airport lounge before your flight or you need to rush to your gate. Thankfully, with a little bit of preparation, getting through airport security can be quick and painless!